1. It appears that 107 South Albany Street has had its exterior design heavily altered, even as the building is just starting framing. The old design’s flat roof and unusual stair column feature have been toned down to a pitched (gable) roof of about the same height and dimensions. According to ads on Zillow, the 1-bedroom units, which will be ready for occupancy by August 1st, will go for about $1,395/month. For the price comes a fully furnished unit with indoor bike storage, high-end appliances, tiled bath, custom cabinets and high-speed internet. Water and snow removal are included in rent, electric is not. Fairly certain Daniel Hirtler is still the architect for Stavros Stavropoulo’s latest residential project. To be frank, I don’t know how much an exterior design can change without having to go back to the planning board – offhand, I think they can do pretty much whatever changes they like, so long as they don’t violate zoning laws or change the habitable square footage. 2. Ithaca architecture firm HOLT Architects totally revamped their website. Among the snazzy new updates was a video. Now, there are an embarrassing number of HOLT projects I can think off the top of my head, but while watching the 1’22” film, there was one project I did not recognize at all. Above, we see two 4 or 5 story residential buildings along a waterfront – the perspective renders behind the gentlemen’s shoulder are likely all part of the same design set, and the white vehicles in the concept site plan are parked boats. It also appears TWMLA is involved as the landscape architect. Blowing up the image gives the name “Lembeck Landing”. At first, I thought it said Lambrou Landing, and had reached out to see if it was part of City Harbor; the response was that this appears to be another project. I tried to analyze the streets, it doesn’t look like an Ithaca map, and one street may be named “Porter”. Probably not Ithaca, but someone’s getting some nice waterfront housing. Watch the video for brief shots showing the inside of CFCU’s new HQ and some selected material finishes. Update: It’s Watkins Glen. An undeveloped parcel near its Porter Street. Thanks to Keith Eisenman for solving the mystery. 3. Let’s just touch on the waterfront real quick. City Harbor is going to be a very substantial project. The first sketch plan involved two large apartment buildings and medical space for Guthrie Clinic; Guthrie would lease its recently purchased warehouse at 770 Cascadilla Street to Greenstar for a bigger, grander co-op; and a third location that will be presented at this month’s planning board meeting. The apartment buildings will be 4 or 5 floors and had ground-level parking with large amounts of surface parking for Guthrie, something that planning board was not a fan of. The other Cascadilla industrial building, 750 Cascadilla, may come down for more parking. On the one hand, underground parking is out of the question due to the high water table, and above ground parking structures have to contend with soil issues as well, likely leading to deep foundations and increased costs. But an asphalt sea on the city’s shores is not something that will get the board’s approval. Still, we are potentially talking hundreds of units, as well as a substantial amount of commercial space (and perhaps jobs) with the Guthrie component and the Greenstar expansion. It may very well be that this and the Green Street Garage plan will be the big development stories for the year. 4. Cornell will not the idea of that glass “hat” die; they’re calling it a “suggestion of a future roof pavilion”. The city’s ILPC probably isn’t comfortable with that suggestion being so close to the historically-designated Arts Quad. Anyway, renovations are underway on Rand Hall into the Mui Ho Fine Arts Library. The $21.6 million project, about half of which is funded by donations, will be ready for students and staff in August 2019. 5. It sounds like the city has had just about enough with the state’s aerial apparatus fire code changes that halted much of Collegetown’s approved development projects. They’re prepared to take steps to eliminate parking on Linden because the new state law says Linden is too narrow as-is to have construction taller than 30 feet. This seems to be in addition to the power line issue. For 210 Linden, whose developer (Visum Dev. Group) specifically applied for some kind of relief, it would just be in front of the building; Todd Fox had already started work when the building codes department were notified and started enforcing the new code, which is not a good scenario. Ithaca would prefer the state grant a broad variance (the new code has apparently been an issue across the state), and normally removing parking wouldn’t “fix” the underlying problem, but since New York State did not notify municipalities they were changing the law, they’re attempting to compromise on something that they normally would not. It might also explain why activity in Collegetown has been quiet these past few months outside of the inner core, where the streets are wider and the power lines are underground. The city is looking into how to make development work with the fire code if the state refuses to budge on code modifications. To be fair, there is tens of millions in development and its associated tax revenue that the city was expecting and that the state, in the midst of a budget crisis, is (literally?) hosing them on. Whatever the city decided at its BPW meeting last week, it seems to have made Visum happy. They’ve started marketing 210 Linden’s units again. It’s saying there are 10 4-bedroom units, and 1 1-bedroom unit, while my notes say 9 4-bedroom units. Maybe the basement was reconfigured? Not sure. Update: According to a Visum Rep, 210 Linden is 9 4-bedroom units and has added a basement 1-bedroom unit. So now it’s 10 units, 37 bedrooms. 6. Around the county, not a whole lot else on municipal agendas at the moment; one of the reasons for no update last week. Dryden town’s planning board will be looking at plans for a new warehouse next to 51 Hall Road, as well as a 5-lot subdivision at 1540 Ellis Hollow Road for Tiny Timbers, the Dryden-based modular home builder. Tiny Timbers uses the warehouse at 51 Hall Road, so it wouldn’t be a shock if the new one is purpose-built for Tiny Timber’s growing business. The town of Ithaca planning board cancelled their last meeting. The city is fairly quiet. The planning board agenda for next week is short and mostly contains smaller submissions – the pair of infill duplexes proposed at 209 Hudson are on the agenda, with some slight design tweaks (the eyebrow windows are an interesting touch on the rear building). To the developer’s (Stavros Stavropoulo’s) credit, the units are design to accommodate families rather than students – the giveaway are the separate dining room areas, vs the eat-in kitchens one typically sees with student rentals. Senior planner Lisa Nicholas also gave written kudos for the quality exterior material choices (Hardie Board fiber cement panels, aesthetic wood timbering, stone retaining walls). A fly in the ointment, per reader email: none of the bedrooms are legal for 2-person occupancy. They are 115 SF each; the state fire code says double occupancy must be at least 120 SF. So that would be an issue if one considers couples’ bedrooms. The board is expected to declare itself lead agency, host a public hearing, and begin review of the SEQR forms needed before a negative declaration for adverse impacts can be declared. 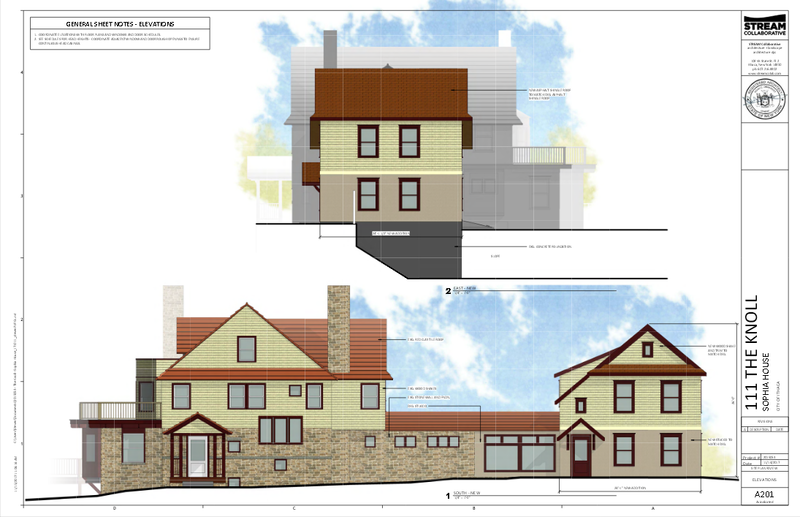 The 4-bedroom addition for Sophia House (111 the Knoll, Cornell Heights) is up for final approval. The proposed playground at Stewart Park is also up for discussion, with the board once again expected to declare itself lead agency, host a public hearing, and begin review of the SEQR forms.BPW is not comfortable accepted the $1.7 million playgrounds, gardens and splash pad unless Friends of Stewart Park creates a $75,000 annual maintenance fund. Lastly, City Harbor will be up for a second round sketch plan, informal discussion to obtain feedback for any future formal submission to consider. The Nines project (311 College Avenue) is not on the board’s agenda this month. Things are up in the air, as the ILPC has chosen to pursue historic designation, even as there is an active project submission. A little awkward, certainly. On the 30th, the Planning Board will convene for a special meeting to finalize the form-based code for the Planned Unit Development to be deployed for the Chain Works District. According to notes from the city Planning Dept, the city approved $130 million in development in 2017. There were 29 projects with 568 housing units, 107 of which are designated affordable for lower & middle income (LMI) households. Also approved was 28,600 SF of new retail & office space. These were from a summary sheet from the planning department, and the detailed write-up will come next month. 7. On a closing note, preliminary estimates suggests that Tompkins County added an average of 1300 jobs over the 2017 calendar year, bringing the average annual job count to 65,300. The gain is just over 2.0%, comfortably above the national average of about 1.5%, but nothing that screams ‘boomtown’. Since 2007, the annual average has increased by 7,700 jobs, +13.8%. The numbers suggest that the gains are slightly better in the fall and spring (7500 – 7700 jobs) than for the summer and winter (7000 jobs), indicating that academic year seasonal jobs are growing slightly faster than the overall market. 1. Here’s an interesting sale – a 62.1 acre parcel on Troy Road sold for $380,000 on the 13th, less than half the original asking price. The buyer, “Troy Heights LLC”, is registered to the same address as Giora and Limor Fix, a semi-retired husband and wife couple who have acquired a number of rental properties around the area over the past decade, with 43 or so units worth something in the ballpark of several million dollars (units are marketed by the Fixes under the name “Homes-for-you Rental Properties”). The Troy Road property is intriguing because there was a development proposal floated there a few years ago. Rural Housing Preservation Associates LLC had proposed a 130-unit combination of middle-market single family homes, townhouses and small apartment buildings for the site back in 2014; it started as 206 units, the town and neighbors complained it was too big, the project was whittled down to 130, and then the proposal was cancelled by September 2015. Using cluster zoning, the project could have built out 145 units in the low-density residential (LDR) zone, since the town’s cluster zoning allows 2.3 units/acre. STREAM was in charge of the project design, and some of the renders of the never-built apartments can be found here on their website. So something to keep an eye on, though it might be a while. 2. Here’s a piece of news from the Times’ Nick Reynolds. With regards to the police consolidation debate, the city wants to have the headquarters downtown on Green Street (likely in that proposed centralized government facility floated for the Central Fire Station site), while the towns would prefer something near the current BPW on the north end of the Northside neighborhood, which offers easy access to Route 13. Consolidation is still a rather unlikely prospect at this time, and there’s little enthusiasm from the more rural parts of the county. But it sounds like the sheriff is keen on killing the city’s ideas before they take off. 3. Bad jobs month for the state, good for Ithaca. The Ithaca metro (Tompkins County) added 1,800 jobs (all private sector) from October 2016 to October 2017, bringing the total to 67,800. The 3.2% increase was the largest gain by percentage in the state over the time period. Unfortunately, the state as a whole lost 11,900 jobs last month, which falls even more to 14,600 jobs when taking away those added by the public sector (government jobs). A study from the Federal Reserve Bank last month notes that upstate economic growth in general has been losing steam over the past year, with exceptions for Ithaca and Albany. New York City is performing reasonably well. While it’s well and good that Ithaca is doing well, I have concerns about the recent tax reform bill going through Congress. With the potential hit to SALT deductions and the taxation of graduate student tuition waivers, I could see significant negative impacts on the local economy. Given that most communities have property taxes in the range of $2500-$4000/$100,000, a cap of $10,000 as proposed by the House would hit many middle-class and upscale neighborhoods hard. A typical home in Ithaca city is worth about $230,000-$270,000 range at this point, and with about $3779 per $100,000 in property taxes, that means that homeowners with properties valued over $265,000 will take a financial hit, close to half of the homes sold. The Senate’s version removes the SALT deduction completely, affecting all local home buyers. Either case would be a severe blow to the home buying market. Another concern is the taxation of graduate student tuition waivers as proposed by the House plan. Speaking from experience, I had a waiver that saved me about $14,000/year at the public university where I did my master’s. In my case, seeing that taxes would have cost an extra couple thousand in theory, though the doubling of the standard deduction might have limited its impact on me. A Cornell graduate student is looking at $20,800-$29,500, and could see a tax bill larger than any savings from the standard deduction increase. The Senate version does not tax tuition waivers. Another, lesser factor to consider is that the student loan interest deduction for borrowers on-time with their payments would be eliminated. On a final note, Cornell’s endowment would be taxed an extra 1.4% under the House bill, as would any college whose endowment is worth more than $250,000 per full-time student. Cornell’s endowment is $6.8 billion, and the school has 23,016 students across all campuses as of Fall 2017. That is over the allowed cap of $5.75 billion as calculated by the bill’s guidelines. The long story short is that Cornell recruitment takes a hit, as does its endowment, and that could impact current employment as well as future hiring. Politics aside, these “reform” bills are definitely a cause for concern from Ithaca and Tompkins’ economic standpoint. 4. A separate note not so much economic, but something many Ithacans care about – the House bill takes away the historic building rehabilitation tax credit. The renovation of 310 West State Street that I reported in the Voice earlier this week would be off the table without them, and the building will likely be demolished if the credits are eliminated. So the impacts aren’t just economic, but perhaps aesthetic as well. 5. This is looking to be a very quiet late November. For the first time in over a year, the town of Ithaca has cancelled two planning board meetings in a row. Meanwhile, in the city, the only “old business” reviews are final site plan approval for the 601 South Aurora duplex, and final approval for the Brindley Street Bridge replacement. 6. So technically, the Request for Proposals went out for the Green Street Garage site. A site tour for interested applicants is scheduled for December 4th, applications are due by January 23, 2018, and no timetable is given for the selection of the preferred developer. The applications are to include a cover letter, application form, description of project team members with relevant experience, proof of ability operate in NYS, good reputation, financial status, marketing plan, tenant management plan, conceptual designs, financing plan and demonstrated capacity to obtain financing, purchase price, project schedule, community impact benefits statement, schedule, and specific concerns (acknowledgement of site issues and plan to resolve them). A $500 application fee is also required. Obviously, Ithaca Associates LLC has a huge leg up on the competition, since they not only have a plan fleshed out, they own the ground lease under the eastern end of the garage that everyone else would have to negotiate to obtain. About the only legitimate opening to another developer would be for the western and central portions of the garage, though the city’s requests make it such that anyone else interested had better be thinking big with housing, parking, and other site uses. Saying you’d leave things as-is would be an immediate disqualifier. Unless Fox or Lubin are dreaming up multi-story apartment buildings, it isn’t likely many developers will entertain this RFP. This really feels like it’s just the city stalling for time so they can fully absorb the immensity of the 365-unit, $118 million “Village on the Green” proposal. 1. In the town of Ulysses, work continues on a rezoning and reimagining of the hamlet of Jacksonville. The town held a meeting for public feedback this past Thursday. For those who are unfamiliar, Jacksonville is a cluster of a few dozen houses and a few small businesses about two-thirds of the way up Route 96 from Ithaca to Trumansburg. The town is working with local urban planning firm Randall + West to redevelop the hamlet, which has been plagued in recent decades with not just the standard rural upstate flight, but total disinvestment in some parts as a result of a massive gas spill in the late 1970s that poisoned the wells of neighboring properties, which Exxon bought and left in a state of low, sporadic maintenance. However, some areas are served by municipal water systems, and the town is looking at expanding the hamlet zone, and creating a hamlet center zone in the hopes that they can give the hamlet “quality growth” and a Trumansburg-like flavor – small shops and density at the core, and somewhat walkable for basic errands, with sidewalks and interconnected streets. It’s a bit reminiscent the old “nodes” concept pushed by the county about a decade ago, but with more emphasis on walkability. The zoning brief shows participants have expressed a preference towards small-lot houses and 2-4 floor mixed use. With the latest public meeting completed, the plan is to have a zoning draft ready by March. For the record, Ulysses permited 11 new homes in 2016, so even if the revised Jacksonville hamlet zoning becomes more accommodating, don’t expect a boomtown. 2. From the IURA Neighborhood Investment Committee agenda, a few more details about Habitat for Humanity’s plans for 402 South Cayuga Street. Four units, $720,000 construction cost, about $799,500 with soft costs. Savings from volunteer labor reduce the cost to $709,500. Funding comes from $100k in cash equity attained by the sale of the Morris Avenue townhouses, $300k in grants and $120k in HUD funding. Private donors and grants are expected to contribute about $189k. The initial design and land purchases expenses are being covered with funds from the $50,000 sale of a 32-acre parcel in Trumansburg for public green space. With multiple transactions required before anything can move forward, the plan is to break ground in June 2018 with construction lasting from 18-24 months. The units will be sold to families making 30-60% of local AMI (i.e. $16-$32k/year) who put in the requisite sweat labor and take approved home-ownership and finance courses. The units will be solar-capable, though they’re still debating if the panels will be installed by Habitat or the responsibility of owners. By the way, the bright colors of the units are intentional. The committee has said this project pretty much checks off every box on their want list, and Habitat for Humanity has been named preferred developer; contingent on approvals, the IURA will sell the property to the non-profit for $32,000. 3. For those that might have missed it, the Times’ new journo, Matt Butler, did a nice piece on TCAction’s Amici House development. The 23-unit project will be up for prelim approval at this month’s Planning Board meeting. In the piece, TCAction Director Lee Dillon notes that it’s not strictly for drug rehab, it’s for homeless youth regardless of the presence of addiction. The project also provides a low-cost childcare center with five HeadStart classrooms able to support 40-45 kids. Apart from a couple of concerns and complaint, reactions have been generally receptive to the plan, which will be located at 701 Spencer Road on the southern edge of the city. As a former Head Start student, I never knew it was geared towards low-income families until I was in high school. There’s a lot of real, tangible value to Head Start as an early education program, especially in a community like Ithaca where the school district the kids enter into is capable and well-regarded. I applaud the Amici House project and look forward to its construction. 4. Tiny Timbers is getting quite creative. In addition to the five existing designs, Buzz Dolph’s team, working with architect Noah Demarest, have rolled out two new designs. The first is a one-story, two-bedroom house which looks to be in the 630 SF range, with the option of deleting the second bedroom available. The second design is called “big cube”, with a 21′ x 21′ footprint (two stories, 882 SF), slightly larger than the 18′ x 18′ regular cube. The website seems to be down for an update at the moment, but the 3D panorama still works. The town of Dryden has granted approval to the Varna site, so at this point marketing and sales of the home sites should be getting underway soon. If successful, Tiny Timbers could be a solution to meeting an underserved and difficult-to-serve segment of the Ithaca market – new, modestly-priced homes. 5. Here’s the funding application for the first stages of the Tompkins County Heritage Center. The request is for $35,500 from the legislature. That would cover community presentations, legal fees for partnership agreements, a retail space plan, branding language and design, concept overview, website, floor plans, exhibit design and the launch of a capital campaign later this year (May for the silent campaign, October for the public campaign). Along with the capital campaign, primary funding may come in part from the $500 million URI fund that the state awarded to the Southern Tier back in 2015. The History Center and its partners are exploring some of the way they can reuse the 18,000 SF space currently occupied by Tompkins Trust; for example, multimedia presentations in the former bank vaults. STREAM Collaborative is in charge of the new floor plans, STREAM will work with St. John Design Group to do the branding, and Todd Zwigard Architects will handle exhibit design. The Solstice Group will be providing guidance in assembling and running the capital campaign. To be frank, I’m still not sold on the idea of the Heritage Center being a driver of tourism itself, but I could see it being an enhancement to downtown Ithaca’s other offerings, as well as a gateway for visitors staying at the new hotels near or soon to be open within a couple blocks of the site: “Come for the colleges, wineries and gorges, but check this out while you’re here, you just might find other things you want to do and see”. 6. The initial December 2016 jobs reading of 73,800 rounds out the 2016 jobs reports. Tallying up the average, the initial estimate for the Ithaca metro for 2016 is 71,600, an increase of 1.7% from last year’s average of 70,400. As always, take the initial estimates with a grain of salt, since they’re liable to be adjusted a fair amount in the big March revision. However, should they hold up, it gives Ithaca the highest percent growth of any New York State metro in the past year (although for the record, NYC added 1.1%, or 109,000 jobs in the past 12 months, basically an Ithaca and a half). For reference, the 2011 jobs average was 66,200, and the 2006 estimate was 62,600. With the exception of those neighborhoods closest to the universities, the biggest driver of the housing affordability crisis is not student population growth, which was about 196 over the past year (+285 Cornell, -89 IC). It’s the people relocating to/near Ithaca for work. That doesn’t capture the imagination and emotion as much as saying the city’s being overrun by obnoxious 20-year olds. Q: Where do you see things going in the next 15 years? What will the State Theatre of 2030 be like? Doug Levine: We’d be fresh off celebrating our hundred year anniversary! They don’t build theaters like this anymore, we’ve made a lot of improvements to the building, we’ve completely renovated the restrooms. Technologically, we’ll be a lot more advanced, paperless ticketing will be a seamless transaction. We want to maintain the building charm, it’s just a grand palace, but behind the scenes, we’re getting more efficient and innovative, we’ve upgraded to LEDs, and the stage sound and lights will be a lot more cutting-edge, and we’d like to be more energy efficient. I would like to see more flexible seating in 15 years. We’d stay with DSP [Dan Smalls Presents] long-term, that’s worked out really well for us. We’re going in a good direction and I want to keep building on that success. Q: Dovetailing off that, Ithaca is one of the few growing areas of upstate, and it’s increasingly seen as a tourism and leisure destination. Do you see ways for the State to tap into that? What other opportunities do you see (I noticed something called Ticketfly)? DL: Conferences are a growing opportunity, the growing economy has led to a spike in conferences from all over the state wanting to come here, and those thinking creatively reach out to us, we had 2-3 last year and [we have] more planned, they’ll use us and Cinemapolis, it’s never going to be a big component but it’s nice to have those groups coming in. We average over 50,000 a year through our doors, 40% from beyond Tompkins County – New York, Philadelphia, Canada. 8. It looks like the town of Ithaca wants to extend their two-family home moratorium beyond the initial 9 months. 9 months was explicitly chosen after considerable concern from developers and homebuilders last Spring stemming from the initially-proposed 12 months, which would have impacted two construction seasons. The town doesn’t even provide a new timeline, it leaves a blank next to 2017. Really burning through the goodwill here. Location: 119, 121, & 125 College Ave. Presumably, the Stavropouloses are heading back for some type of major revision to their 6-unit, 9-bedroom proposal. The previous plan was an addition onto the back of the existing century-old property. We’ll see what is changed, and by how much. Zoning is CBD-60 – five floors, no parking. Parking for the medical office building at 821 Cliff Street; perhaps an expansion to help market it, as I see postings for its space scattered throughout commercial listings. Nearby properties are vacant land. #3056, Area Variance, 301 E State St. Regarding 5B., Apparently the city is still having discussions with Fane regarding a development of 330 College Avenue, the former Green Cafe on the SW corner of College Avenue and Dryden Road in inner Collegetown. I write “a” redevelopment because the previous 12-story proposal didn’t look like it was going to make friends and influence people. Also on the long-term agenda are the Maguire plans for the Carpenter Business Park, Ithaca Gun, and Chain Works, which is still undergoing environmental review. Those are going to be long slogs, so don’t worry about missing anything. 1. Another fairly quiet week for that Christmas-New Year’s lull. There wasn’t anything too noteworthy in real estate transactions, but thanks to a construction loan filing, we have a figure for the construction cost of Modern Living Rentals’ 902 Dryden Road project – $1,192,550. The 8-unit, 26-bedroom townhouse project is being financed by Elmira’s Chemung Canal Trust Company, a regional bank which has been looking to expand its presence in the growing Ithaca market. Most mid-sized building loans like this are financed by Tompkins Trust, and this appears to be the largest project CCTC has financed locally; checking the records for the past 12 months, they’ve previously financed a few single-family homes and that’s it. A larger loan like this might be a sign that they’re building confidence in the project and the market. 2. Sticking with MLR, a glance at their webpage gives an interesting detail – the 87-unit, 87-bedroom 815 South Aurora project is now described as having 125 bedrooms. The multi-story apartment project sought and persuaded the city to reduce cellphone tower no-build radii last spring so that it could be built near the South Hill telecommunications mast, but because the city only reduced to 120% of height instead of tower height plus 10 feet (meaning 206 feet instead of 180 feet in this case), the project has to be tweaked. No revised designs have been released, but should something come along, you’ll see it here. Side note, the website has an easter egg – clicking on MLR’s Commons placeholder gives you the 2015 downtown market summary from the DIA. 3. For those interested in learning more about Cornell’s north campus plans, video from one of their meetings can be found online here. The key takeaways – the first building, when it is built, has to be larger enough to function as swing space for Balch Hall, which appears to be first in line for renovations. Balch has 437 bedrooms, to give an idea of the potential capacity of the first new dorms. Dickson is larger (527 beds), but its renovation will be split up over two summers, allowing for partial occupancy while renovations are underway. Lot CC could potentially be replaced with 1,000 beds in multiple buildings, as well as a dining facility (a new dining facility is seen as less urgent and would be further down the line). Those new dorms would eventually be geared towards sophomores, multi-story but “contextual” in height. It sounds like the first concrete plans are expected to be ready by the end of the 2016-17 academic year. 4. The Common Council will be voting on some bond issues next week that will fund several municipal projects. $500k for street reconstruction, $367k for municipal building renovations, $653k for street lights, $600k for a replacement water tank on Coddington Road, $101k for bridge inspections, $181k for the Stewart Park pavilion, $51k for site improvements to the Hangar Theatre property, $134k for design and scoping costs for the Brindley Street bridge replacement, $340k for the Cascadilla Creekway project and a replacement ped bridge at Sears Street, water mains, traffic lights, traffic calming, new police cars, all totaling $6,464,450. A separate measure calls for an additional $950k in bonds to cover the costs of the Stewart Avenue bridge repainting and reconstruction. Some of the money covers design studies for intersections – of particular note is a study considering a roundabout at the “five corners” intersection at Oak Ave/Dryden Rd/Maple Ave, which could be a welcome change from that awkward traffic light currently there. The city issues bonds twice a year, in January and July, to cover its various construction projects. Some of it gets reimbursed with state and federal dollars. 5. I cheaped out on my Voice summary of the top development stories of 2016 – there are only 5, but only because there was no way I had time to do ten this week. Here are five that missed the cut – the cancellation of State Street Triangle and the rise of its replacement, City Centre; the Tompkins County Housing Summit and the Danter Study, which are important but not really attention-grabbing; some progress in affordable housing, with Cayuga Meadows, 210 Hancock, Amici House and Poet’s Landing; the continued growth of Collegetown, with the opening of Dryden South, Dryden Eddy and Collegetown Crossing, and the entrance of the College Townhouses, 210 Linden and 126 College; and the growth of the local economy, which if the numbers hold up to revisions, 2015-2016 will have the second highest year-over-year gain in jobs since 2000 (#1 is 2011-2012). When thinking about what’s in store next year, it’s a little sketchy because of impacts from the incoming Trump administration, and how that could impact the national economy – but if things stay consistent on a large-scale, than Ithaca can expect continued modest but steady growth, mostly in meds and eds, with a bit in tech and hospitality. We’ll probably see a couple new projects proposed in downtown and Collegetown, and maybe some smaller residential and commercial projects in other neighborhoods, like the Elmira Road strip and State Street Corridor. The town of Ithaca, it’ll depend on if they get their new zoning sorted out; if they do, there might be a burst of new proposals in some areas. The other towns, it’ll be hit or miss, maybe a larger proposal in Lansing or Dryden but otherwise scattered-site single-family, par for the course. Also, keep an eye out for more housing proposals from Cornell. 6. It’s quiet week, so let’s finish this up with a little water cooler gossip. From the rumor mill, some of the potential tenants being discussed for the Masonic Temple include a microbrewer (good thing the city just updated their zoning to allow microbreweries), professional event space, and a church. That last one seems a little unusual, but to each their own. The renovation plans call for three rental spaces, one of which is geared towards restaurant tenants.